April 11 planning meeting. Anyone know what other things must happen prior to the start of building? Updated plans going before Planning Commission August 29th. Unit count and layout essentially the same but significant changes to exterior appearance. I like it a lot, more brick and cornices will fit in well with the neighborhood. Ditto the Mansard roof. Wow. That has the potential to look really good. Has anyone heard if this little Victorian is going to be demolished or moved? There's a perfectly-sized vacant grass lot right across the street owned by PPL. Could it really cost much extra? Pretty sure it's toast, based on the site map. I like the outside masonry on the building. I think it looks a lot nicer than the original. If this goes through, any chance they'll start construction before the end of the year? EOst wrote: Has anyone heard if this little Victorian is going to be demolished or moved? There's a perfectly-sized vacant grass lot right across the street owned by PPL. Could it really cost much extra? In the document they say they plan to demolish it (Page 2). Shame. Seems like such a no-brainer, especially since nothing could ever be built on the lot across the street without demolishing (probably) the whole row of houses. Very true. Single homes can be infill too. There wasn't enough of one color of brick in stock so they had to use several? 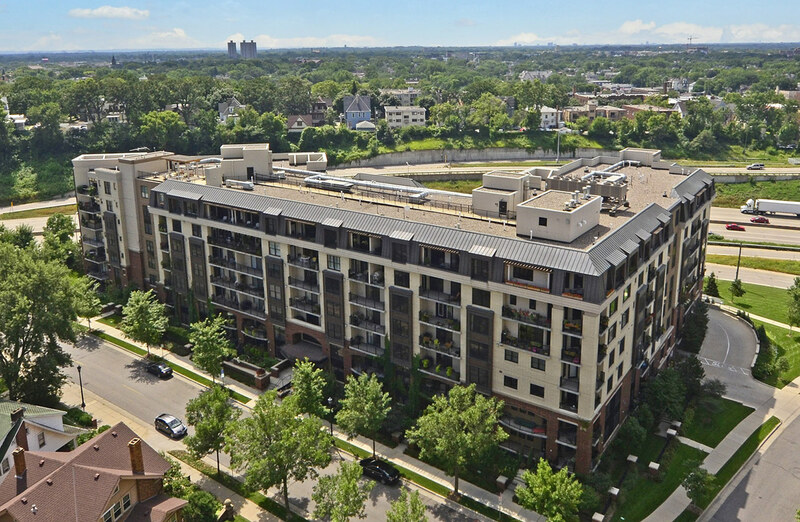 It's going to end up looking like 317 Groveland in Loring Park. I think it looks considerably better than 317 Groveland. 317 Groveland has so many terrible dead ends in its design. I really like this in comparison to the original. You get some post modern features on park, including that nice covered retail area that looks really nice. It would be great to have a(nother) restaurant over here. Lots of ground entry units and a much more cohesive materials scheme than the last go around. I'm pretty stoked for this one. Especially as a neighborhood changer. Nathan wrote: Especially as a neighborhood changer. In any case, I don't think any of these massive, full-block developments, built to superficially resemble 18th/19th-century European-style development, will ever be considered an architectural success over the long term. The way they try and emulate a block full of smaller buildings, while actually just being a hotel-style line of shotgun-narrow units built around one central hallway, is so manifestly inauthentic, as well as weak in terms of unit design (outside of having some shiny new appliances and interiors). Is that an alley next to the old church? I mean that in terms of density, added housing, added retail, less surface parking/vacant lots. It may be false in terms of the size and scale and segmentation but this project is a lot higher quality and uniform in terms of design and materials than places with real high rents in uptown. fehler wrote: Is that an alley next to the old church? Yep. They hint about trying to knock down the church in coming years, but it's landmarked so there's no way that could happen without a condemnation. Of course, if they don't stabilize the structure, the vibration might be enough to do the trick. beige_box wrote: In any case, I don't think any of these massive, full-block developments, built to superficially resemble 18th/19th-century European-style development, will ever be considered an architectural success over the long term. The way they try and emulate a block full of smaller buildings, while actually just being a hotel-style line of shotgun-narrow units built around one central hallway, is so manifestly inauthentic, as well as weak in terms of unit design (outside of having some shiny new appliances and interiors). Do you have any policy prescriptions to build authentic blocks of piecemeal walkup housing + courtyards where units face the front and rear rather than full- or half-block apartments with central hallways? What are the benefits? What are the tradeoffs? Could it even be built given current construction labor/material/building code/ADA realities? Or are you just here to complain about windowless bedrooms again?